I still had some leftover apples from the orchard so I thought I'd just whip some up for him. I figured, even if he didn't eat it, my husband or I would. Since I had some extra peaches from my Apple Peach Salsa in the freezer, I decided to throw some of them in for a nice variation. 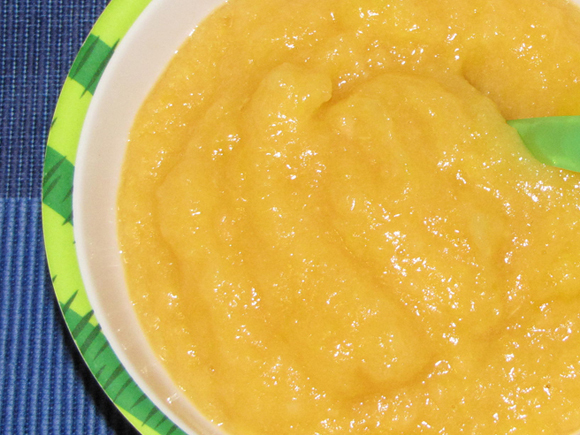 I normally don't add sugar when I make applesauce, but the peaches were pretty tart so it needed a little sweetness. The blend of apples and peaches were, once again, a perfect pair. 1. Cook all ingredients in a large pot over med-low heat, stirring occasionally for about 30 - 40 minutes.